I have a couple of neat little examples of how PR can be very effective in gaining ongoing recognition for your product or brand. Our client Carol runs the Shoe Garden and got a mention in a pretty obscure local magazine. A few months later Carol gets a call from a statewide TV variety show that wants to feature her large women’s shoe shop on their program – they’d read the story. And a TV segment on a statewide TV show can lead to superb recognition. Carol also tells the story of a customer just recently who came in because she saw a story on the shoe shop in a local newspaper – 2 years after the story ran! 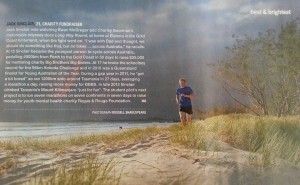 A couple of years back my 23 yo son Jack was a Finalist in the Pride of Australia Awards here in Queensland. He goes up to the presentation day and comes away empty handed – bad luck young fella! A few days later he gets a call from a local journo who saw him mentioned as a finalist and was writing an article about Queensland’s Top 50 Best & Brightest. Sure enough, a few weeks later the Courier Mail newspaper prints their Top 50 Best & Brightest and Jack gets a very nice mention (interesting because he’s not even the “Best & Brightest” in his own family!). Getting publicity for your business is all about momentum. If you can get a little story going then that will lead to bigger and bigger stories. The little stories give you the credibility you need to be considered for the bigger stories. Get known offline – raise your media profile now.